tropical fish include fish found in tropical environments around the world, including both freshwater and saltwater species. 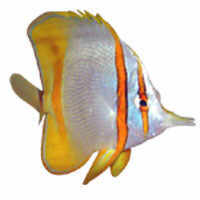 Fishkeepers often use the term tropical fish to refer only those requiring fresh water, with saltwater tropical fish referred to as marine fish. 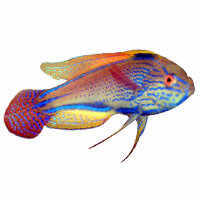 Saltwater fish from coral reefs are famous for their bright coloration with some fish being fluorescent. These big beauties are luridly coloured and very interesting to watch, but not for the faint hearted aquarist. They need large aquariums and should not be kept in groups. Two angels might be kept in the same aquarium provided it is a large aquarium, they are properly acclimated as juveniles, and they are have very different colouring and body shape. However, because all Angelfish have essentially the same diet, mixing them is a feat that should be left to only advanced keepers. None are reef safe, and a potential owner should be aware that they need to have plenty of vegetable matter in their diet. They undergo major changes in colouration while maturing, and unless specified given descriptions are for adult specimens. Taxonomically, "basslet" is really a poor name for these kind of fishes, but that’s the way they are often sold, so that’s how they will be described here. Taxonomy aside, basslets are generally related to the “true basses” (Family Serranidae) like the fishes from the Family Grammatidae, the so-called Grammas and Assessors, and the Dwarf Seabasses from the genus Serranus, which actually are from the Family Serranidae. Basslets are found mostly in the Western Atlantic, and most commonly associated with coral reefs. Some of the species are found at depths of more than 90 – 100 m. Basslets are found on reef slopes close to caves, ledges, or coral formations. Most Basslets reach a size of 5 - 6 cm in length in an aquarium, and the largest reaches an adult size of 10 -12 cm in the wild. Basslets are colorful, hardy, and generally peaceful, although they may become territorial. If more than one member of the species is added to the aquarium, add these fish simultaneously, as severe conflicts may arise. Most of the Basslets are observed as solitary individuals, and since they are not sexually dimorphic or sexually dichromatic and you can't visually tell the difference between males and females, it's best to maintain them alone. Offer these fish plenty of hiding places. When initially introduced into the aquarium, a basslet may hide for several days, or even a couple of weeks, before coming out to inspect their new surroundings. Depending upon the size of the aquarium, other inhabitants, lighting and décor, they will become bolder over time. Although they may never become as bold as a butterflyfish or clownfish, they will gradually become a more conspicuous part of your fish community. 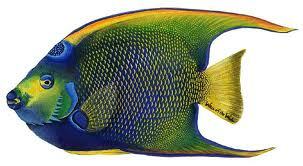 Found in most oceans of the world, butterfly fish are small, thin, disk-shaped fish with pointed noses. There are many varieties, the four-eyed butterfly probably being the most common from New England to the Caribbean. Many of these fish have a dark band running vertically through each eye. This is an aid for the fish being able to camouflage themselves on the coral reefs where they live. Most butterfly fish have pointed snouts, very useful for plucking out the small coral animals and getting into small crevices for tiny invertebrates which they feed on. . The four-eyed is pale yellow or whitish, with a dark eye band and a large dark spot on the tail. To a predator, the tail appears to be the fish's head and often allows the butterfly to escape being the "blue plate special" of the day. The clownfish or anemonefish is from the subfamily Amphiprioninae in the family Pomacentridae. In the wild they all form symbiotic mutualisms with sea anemones.This means they benefit from living with the sea anemone, and the sea anemone benefits from the presence of the clownfish. Depending on species, clownfish are overall yellow, orange, reddish, or blackish, and many show white bars or patches. They are the only fish that are able to live in sea anemones and not get stung by their tentacles. Clownfish are very active fish and are extremely aggressive. 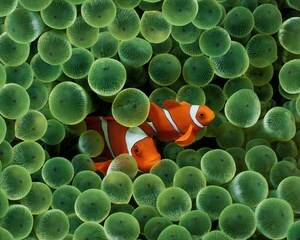 Because they are quite active, the clownfish are thought to be "clowning around". They defend their territory and the sea anemone that they live in. Clownfish eat the leftovers from fish on the anemone and algae. The leftovers include copepods, isopods and zooplankton. The family of of surgeonfishes, tangs, and unicornfishes is Acanthuridae ("thorn tail"). It includes about 80 species in six genera, all of which are marine fish living in tropical seas, usually around coral reefs. 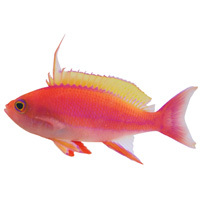 Many of the species are brightly colored and popular for aquaria. Surgeonfishes sometimes feed as solitary individuals, but they also often travel and feed in schools. It has been suggested that feeding in schools is a mechanism for overwhelming the highly aggressive defense responses of small territorial damselfishes that vigorously guard small patches of algae on coral reefs. The Wrasses constitute one of the largest (the second largest family of fishes (after the Gobies with at least 60 genera and six hundred plus species.) and most diverse families of marine fishes. From amongst the smallest (Minilabrus striatus of the Red Sea at under two inches and part of an ounce) and largest (the Napoleon Wrasse, Cheilinus undulatus at more than seven feet and four hundred pounds) of species, they are plain to outright gaudy in their markings and coloration, easygoing to the point of total non-competitiveness to true terrors of the reef. (Labrid fishes are found in shallow waters, tropical to semi-temperate, worldwide with the exception of the Arctic and Antarctic seas).